Ohio Class Ballistic Missile Submarine: Laid down, 4 April 1977, at the Electric Boat Division of General Dynamics Corp., Groton, CT.; Launched, 26 April 1980; Commissioned, USS Michigan (SSBN 727), 11 September 1982; Michigan is assigned to the US Pacific Fleet and is homeported at Bangor, WA. 12 June 2009 converted to SSGN. 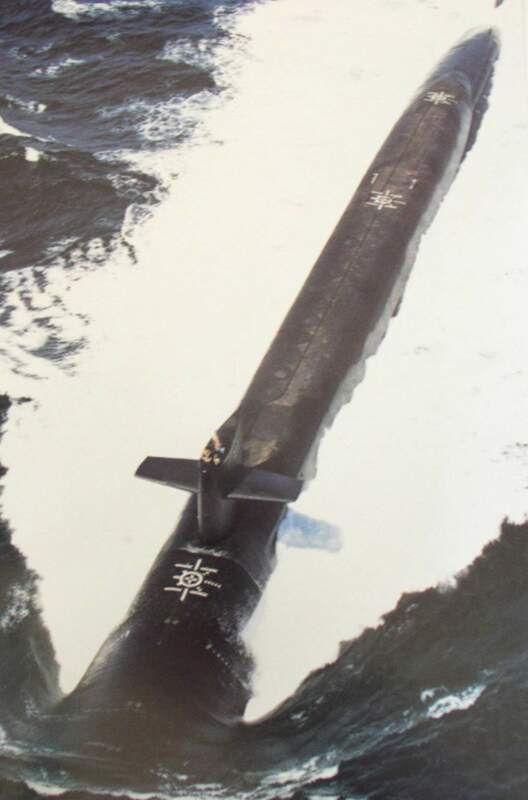 34k Cut out/cross section of the Ohio Class (SSBN-726-743) USN photo courtesy of globalsecurity.org. 53k Cut out/cross section of the Ohio Class (SSBN-726-743) USN photo courtesy of globalsecurity.org. 47k The Michigan (SSBN-727) under construction, 7 April 1979. Courtesy of USNI. 1.07k Taken 8 December 1979 during the launch of the Phoenix (SSN-702). 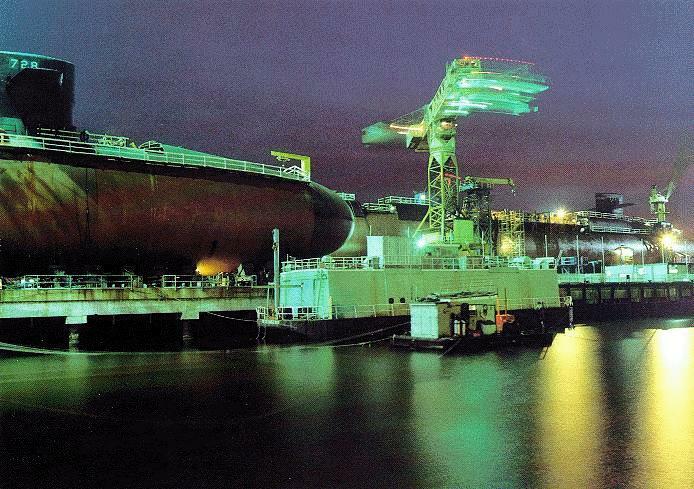 Ohio (SSBN-726) is in the water, the Michigan (SSBN-727) is on her starboard side out of the water, and the Florida (SSN-728) is partially visible (starboard/aft) in the large assembly building. The Boston (SSN-703) is barely visible just inside the open bay doors in the small assembly building closest to the starboard side of the Florida (SSBN-728) and the Phoenix is being launched. I believe that the City of Corpus Christi (SSN-705) is barely visible behind the closed bay doors to the port of the Phoenix. USN photo courtesy of globalsecurity.org. 108k Michigan (SSBN-727) on Alpha trials, circa June 1981 - May 1982. Photo i.d. courtesy of Steven F LeBlanc. 289k An aerial port quarter view of the nuclear-powered strategic missile submarine Michigan (SSBN-727), circa June 1981 - May 1982. Photo i.d. courtesy of Steven F LeBlanc. 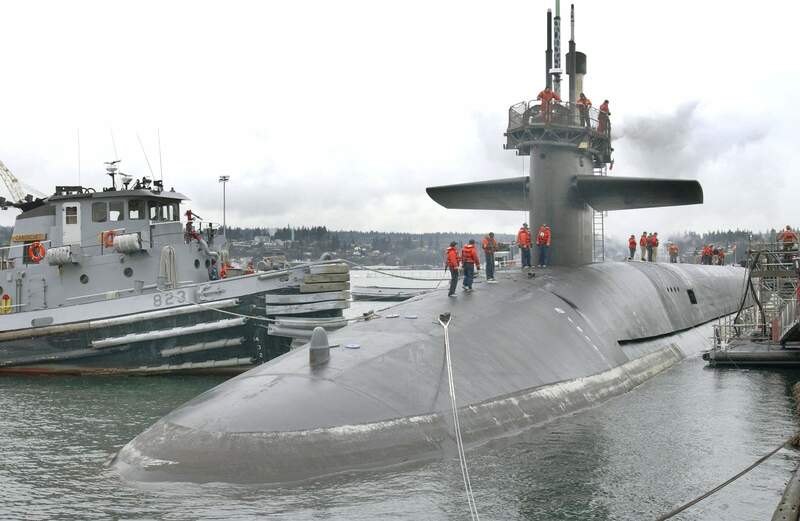 Official USN photo # DN-SC-83-06991 by General Dynamics Electric Boat, from the Department of Defense Still Media Collection, courtesy of dodmedia.osd.mil.& submitted by Bill Gonyo. 510k A starboard bow view of the nuclear-powered strategic missile submarine Michigan (SSBN-727) taken before June of 1982. Photo i.d. courtesy of Steven F LeBlanc. 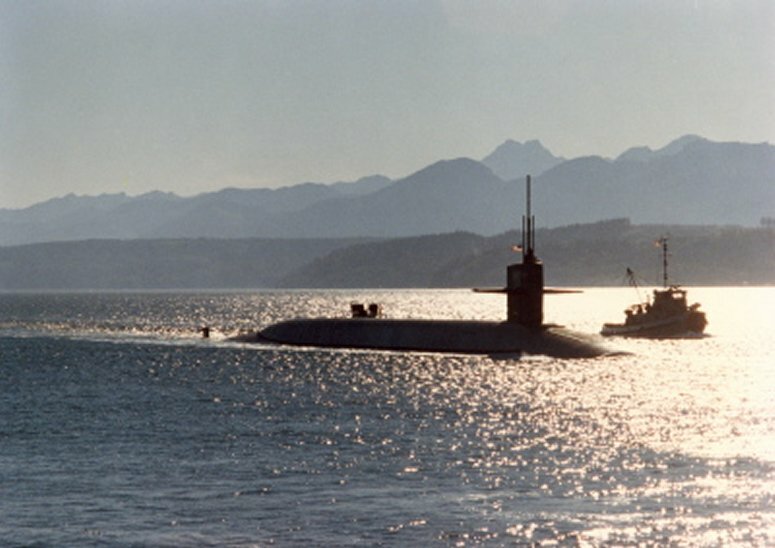 Official USN photo # DN-SC-83-08824 by General Dynamics Electric Boat, from the Department of Defense Still Media Collection, courtesy of dodmedia.osd.mil.& submitted by Bill Gonyo. 243k Port quarter view of the nuclear-powered strategic missile submarine Michigan (SSBN-727). The crew stand at the rail, prior to the arrival of the guest speakers and the beginning of the commissioning ceremony on 11 September 1982. Official USN photo # DN-ST-82-11274 by General Dynamics Electric Boat, from the Department of Defense Still Media Collection, courtesy of dodmedia.osd.mil. 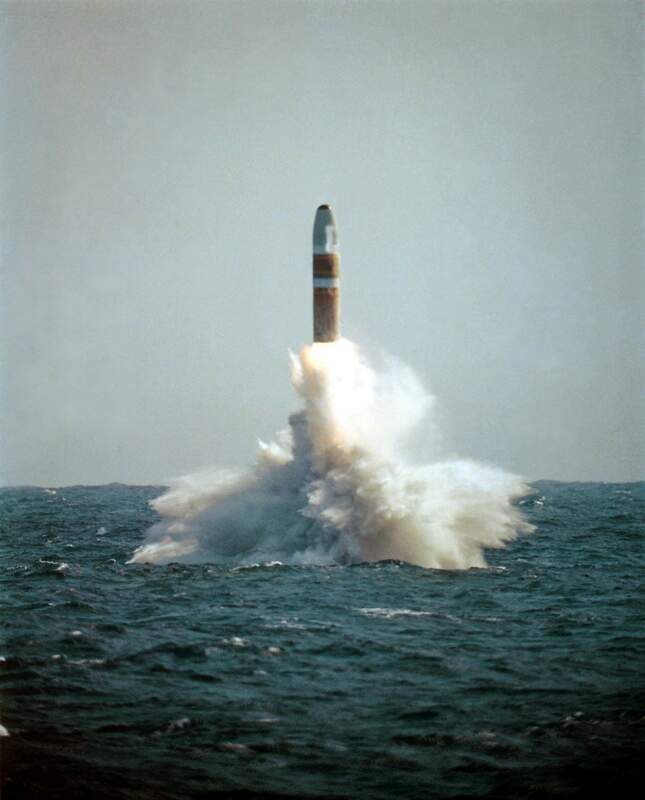 163k A view of a demonstration of a Trident submarine-launched ballistic missile (SLBM) from the nuclear-powered strategic missile submarine Michigan (SSBN-727) between January and March of 1983. Photo i.d. courtesy of Steven F LeBlanc. Official USN photo # DN-SC-83-04706, from the Department of Defense Still Media Collection, courtesy of dodmedia.osd.mil. & submitted by Bill Gonyo. 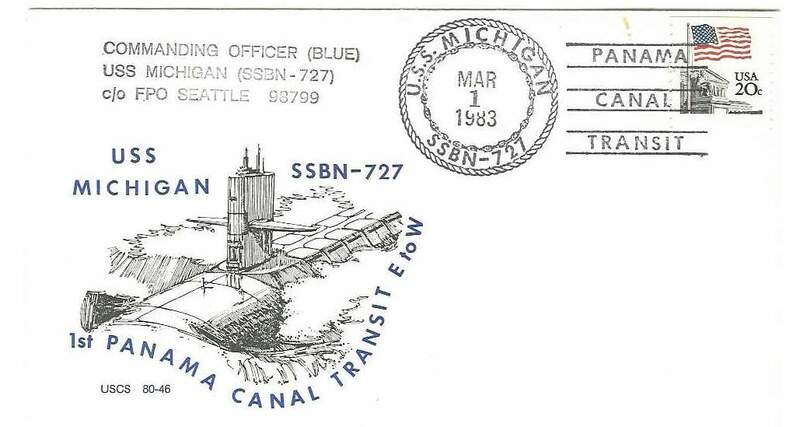 68k Commemorative post card First Panama Canal transit e-w of the Michigan (SSBN-727), 1 March 1983. Courtesy of by Paul Petosky. 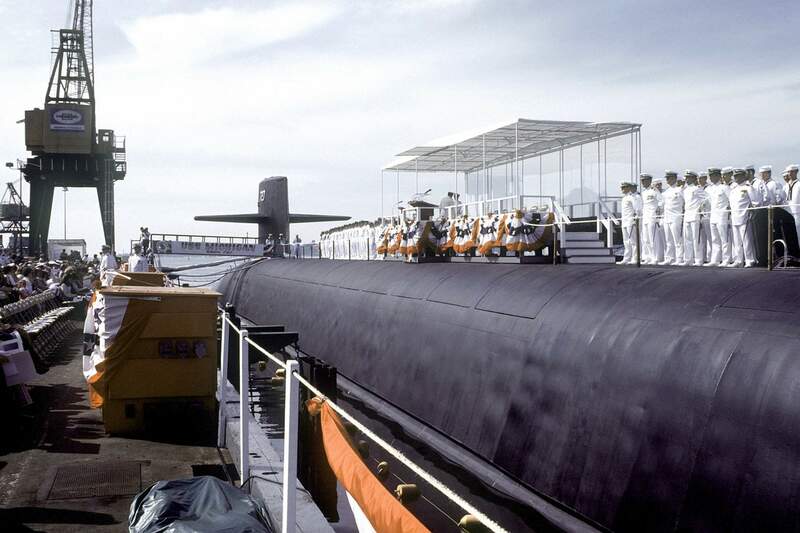 418k A port bow view of the nuclear-propelled strategic missile submarine Michigan (SSBN-727) being towed into the Magnetic Silencing Facility, circa 1 April 1983 at Bangor, Washington. Official USN photo # DN-SC-83-09037 by Gerald W. Grimm, from the Department of Defense Still Media Collection, courtesy of dodmedia.osd.mil. 489k An aerial port side view of the nuclear-powered strategic missile submarine Michigan (SSBN-727) underway on 1 April 1983. 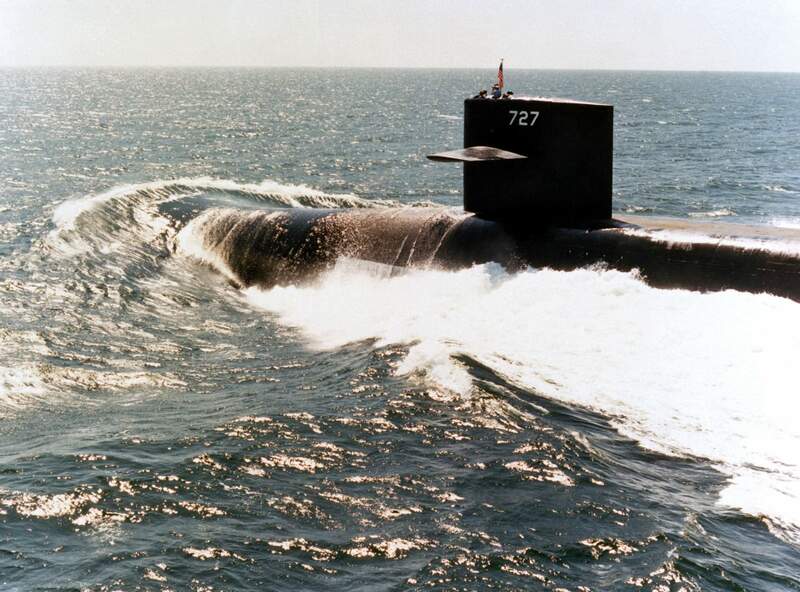 Official USN photo # DN-SC-83-06989 by General Dynamics Electric Boat, from the Department of Defense Still Media Collection, courtesy of dodmedia.osd.mil.& submitted by Bill Gonyo. 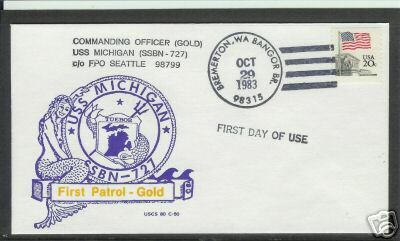 21k Commemorative post mark on the occasion of the first patrol of the Michigan's (SSBN-727) Gold crew, 29 October 1983. Courtesy of Jack Treutle (of blessed memory). 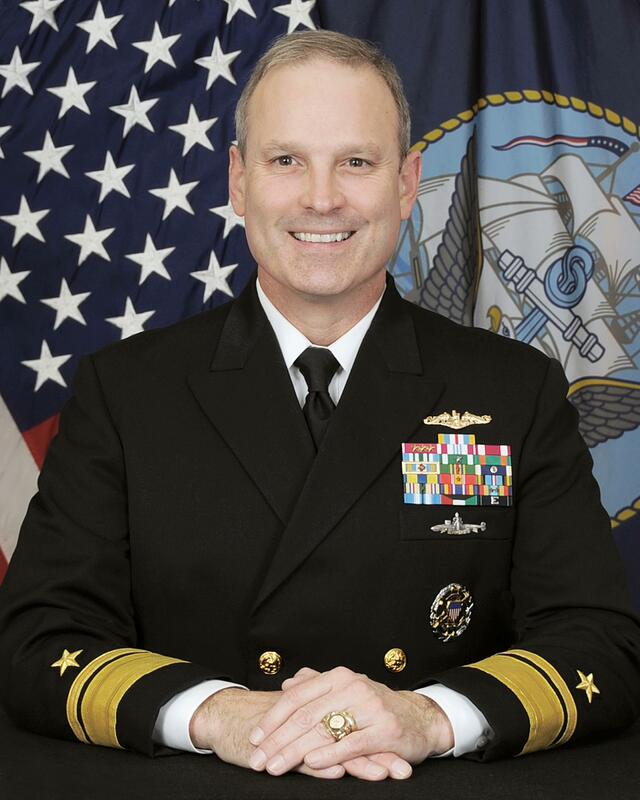 639k Born in Rio de Janeiro, Brazil, Rear Admiral Dietrich H. Kuhlmann graduated from the U.S. Naval Academy in 1983. Kuhlmann's operational tours include: commander, Michigan (SSGN-727); executive officer of Boston (SSN-703); submarine operations officer Cruiser Destroyer Group 5; combat systems officer Guitarro (SSN- 665); and electrical officer, damage control assistant and tactical systems officer Florida (SSBN-728) (Gold) Kuhlmann's shore tours include: commander, Submarine Group 9; director, Operations Division, ASN(FM&C), FMB-1/Fiscal Management Division (N821); chief, Program and Budget Analysis Division Joint Staff, J8; deputy chief, Capabilities and Acquisition Division, J8; deputy director for Investment and Development for the Office of the Assistant Secretary of the Navy (Financial Management and Comptroller); executive officer of the Tactical Readiness Evaluation Team on the staff of commander, Submarine Force Atlantic Fleet; Research and Development and Major Defense Acquisition Program analyst on the staff of the Chief of Naval Operations (N80); cryptologic field and direct support officer on the staff of the Commander, Pacific Fleet Kuhlmann holds a Master of Science in Engineering Management from Catholic University, and served as an associate fellow on the Chief of Naval Operations' Strategic Studies Group XVII and a fellow on Seminar XXI. His personal awards include the Defense Superior Service Medal, Legion of Merit (4 awards), Defense Meritorious Service Medal, Meritorious Service Medal and other individual and unit decorations. USN photo & text courtesy of Bill Gonyo. 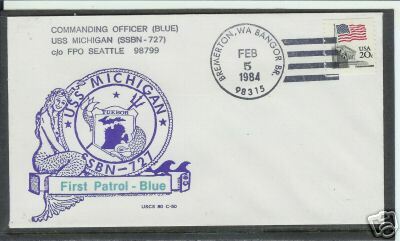 21k Commemorative post mark on the occasion of the first patrol of the Michigan's (SSBN-727) Blue crew, 5 February 1984. Courtesy of Jack Treutle (of blessed memory). 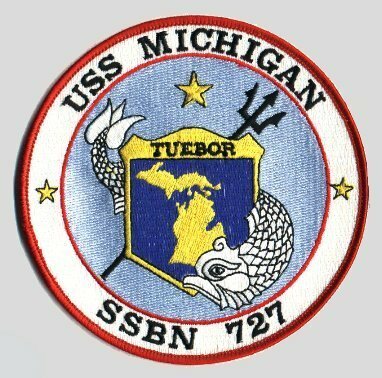 1.70k 29 page Blue (1985) & Gold (1998) Welcome Aboard the Michigan (SSGN-727) PDF's. USN photos courtesy of Scott Koen & ussnewyork.com. 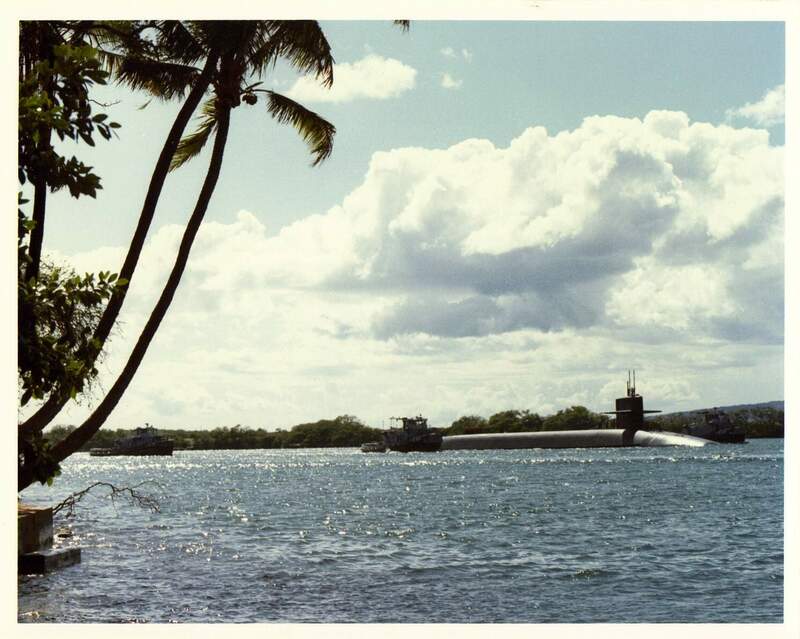 200k Michigan (SSBN-727) underway in the channel heading to Pearl Harbor, taken in 1987. Official USN photo submitted by Robert M. Cieri. 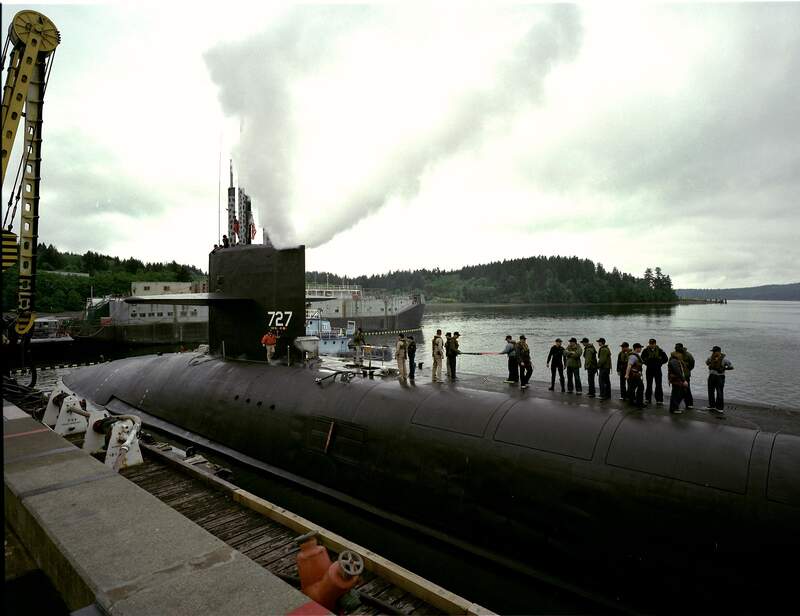 64k A tug boat helps the Michigan (SSBN-727) through the Hood Canal, 1990. USN photo. 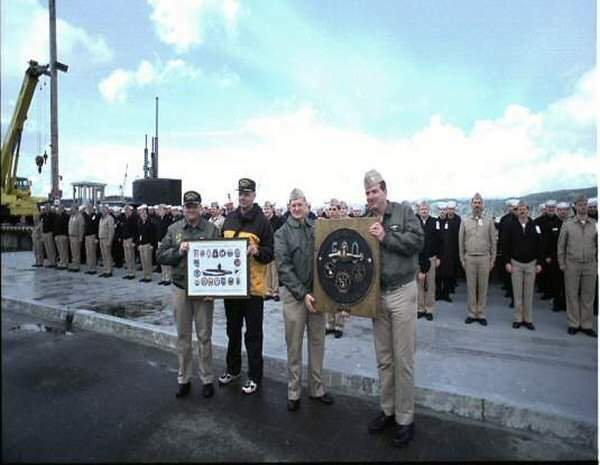 30k Celebrating the 500th Trident Submarine Strategic Deterrent Patrol is the crew of the ballistic missile submarine Michigan (SSBN-727) display commemorative items on 8 April 1998 at Naval Submarine Base Bangor, Wash. Michigan returned after the 500th Trident Strategic Deterrent Patrol. Official USN photo # N-6497N-004 by Brian Nokell, courtesy of news.navy.mil.& submitted by Bill Gonyo. 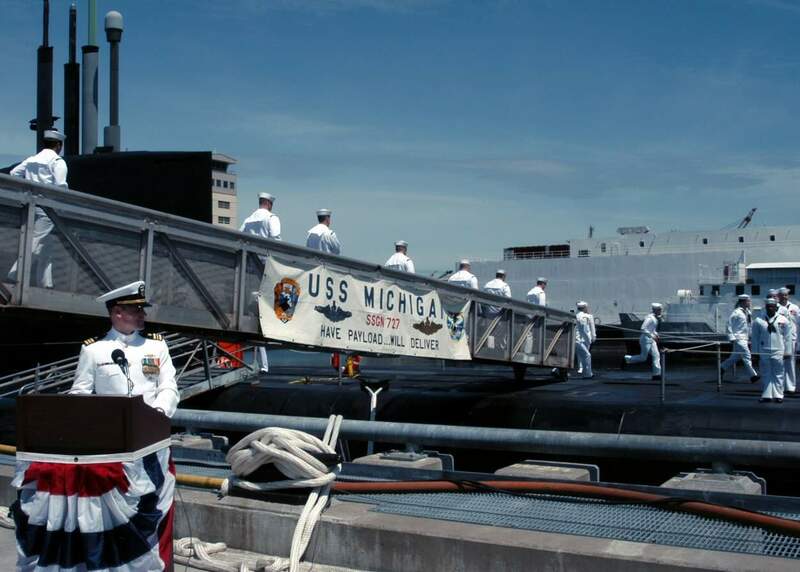 539k Crew members stand ready on the deck of the ballistic missile submarine Michigan (SSBN-727) for the raising of the colors at Naval Submarine Base Bangor, Wash., 7 May 1998. USN photo by Brian Nokell, courtesy of news.navy.mil. & submitted by Bill Gonyo. 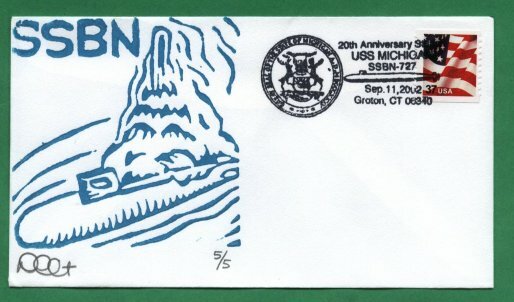 36k Commemorative post mark on the occasion of 20 years of Michigan (SSBN-727) keeping the peace, 11 September 2002. Courtesy of by Jack Treutle (of blessed memory). 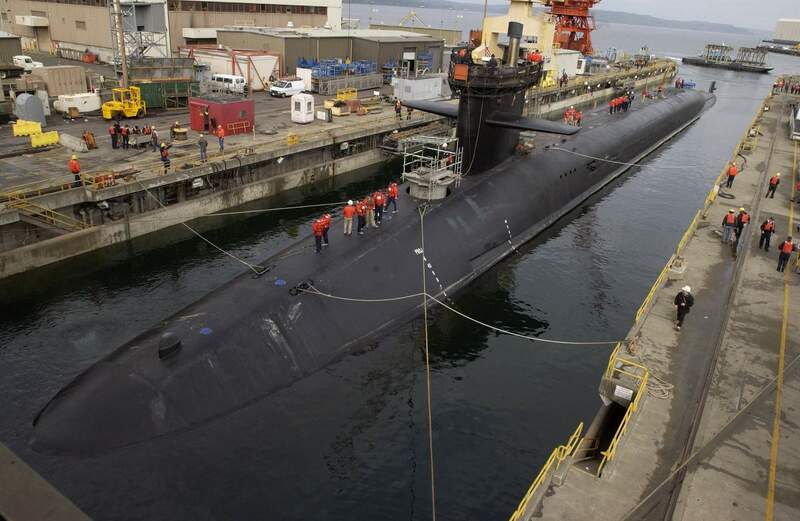 256k Sailors complete the 200th drydocking maneuver of a Trident submarine at the Intermediate Maintenance Facility (IMF) Delta Pier at Naval Submarine Base, Bangor, Wash. on 14 November 2002. 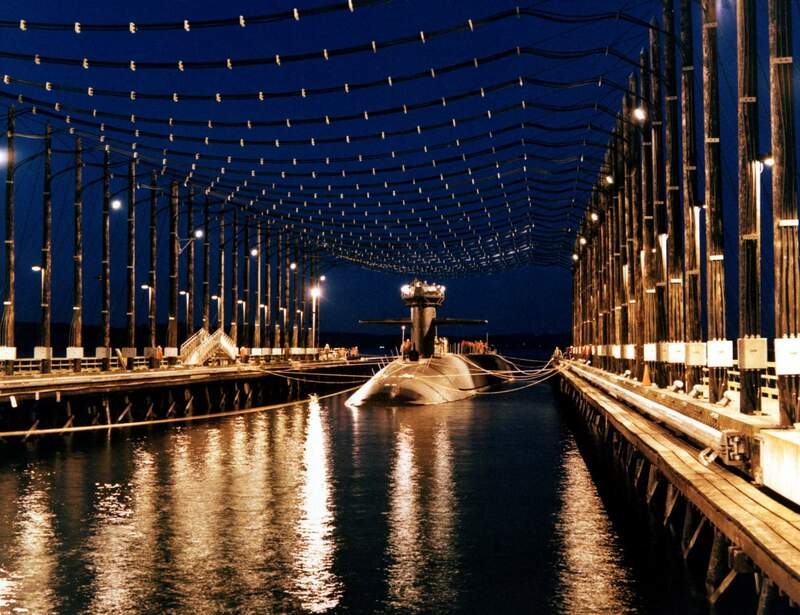 The strategic missile submarine Michigan (SSBN-727) is one of the Trident submarines that IMF has performed maintenance and a substantial level of overhaul work for which they recently celebrated their 20th anniversary. U.S Navy photo # N-6497N-150 by Brian Nokell, courtesy of news.navy.mil. 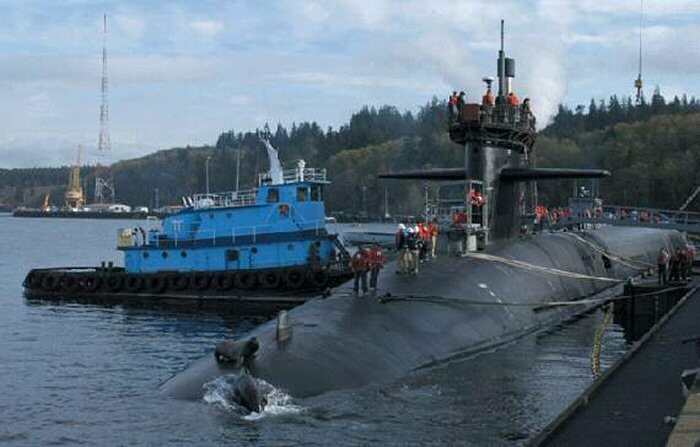 493k The Ohio Class fleet ballistic missile submarine Michigan (SSBN-727) enters into the Puget sound naval shipyard and intermediate maintenance facility at Bremerton, Wash. 2 February 2004 to commence engineered refueling overhaul and eventual conversion from a fleet ballistic missile submarine (SSBN) to a guided missile submarine (SSGN). U.S Navy photo N-1003P-001 courtesy of news.navy.mil. 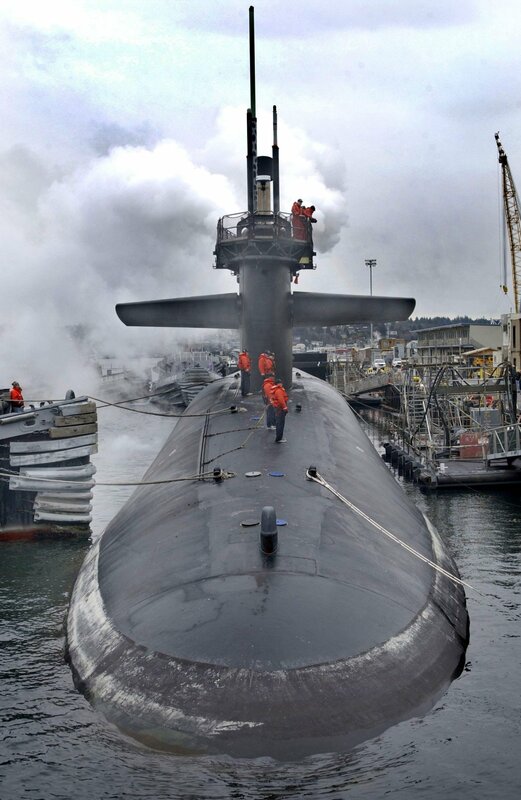 510k The tug Canonchet (823) nudges the Michigan (SSBN-727) into the Puget Sound Naval Shipyard & Intermediate Maintenance Facility (PSNS) to commence Engineered Refueling Overhaul and eventual conversion from a Fleet Ballistic Missile submarine (SSBN) to a Guided Missile submarine (SSGN) on 2 February 2004. 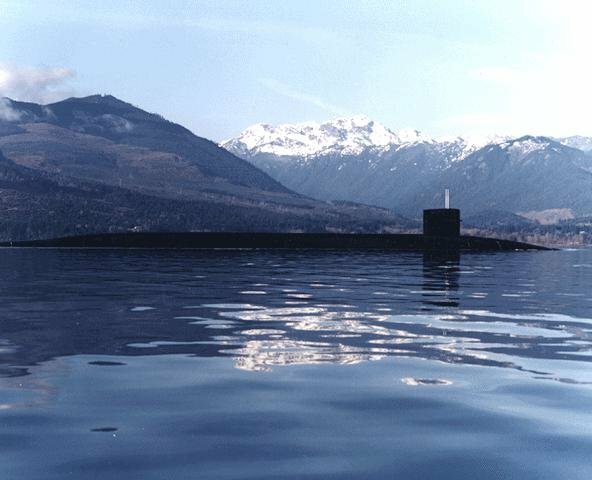 Since arriving in Bangor in 1983, the submarine has successfully completed 66 strategic deterrent patrols. U.S Navy photo # N-1003P-002 courtesy of news.navy.mil. & submitted by Bill Gonyo. 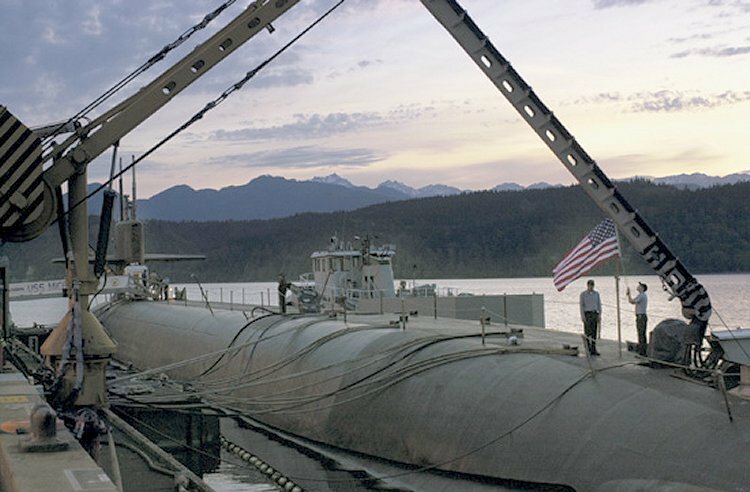 76k Colors are lowered on Michigan (SSBN-727) as the sun sets behind the Olympic Mountains. 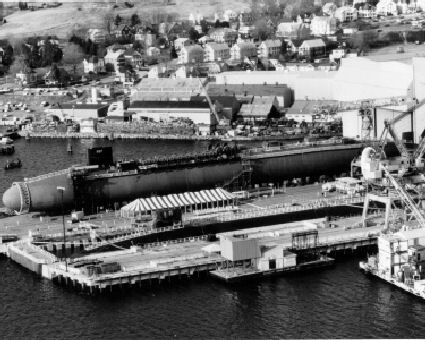 Michigan was moored at the Delta Pier, Naval Submarine Base Bangor, A, date unknown. Photo by Brian Nokell, courtesy of All Hands Magazine. 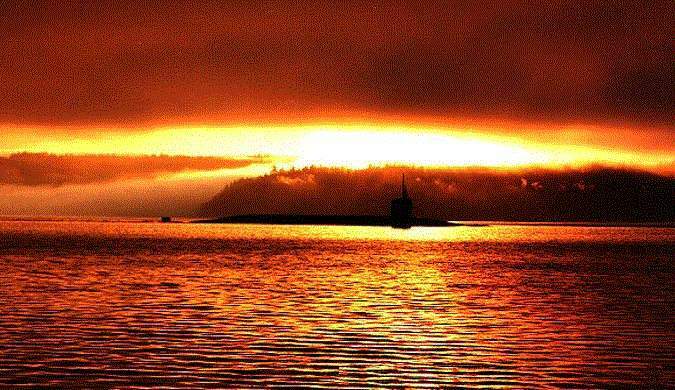 65k Michigan (SSBN-727) steams the Puget Sound at sunset. USN photo from the National War College papers, courtesy of Bill Gonyo. 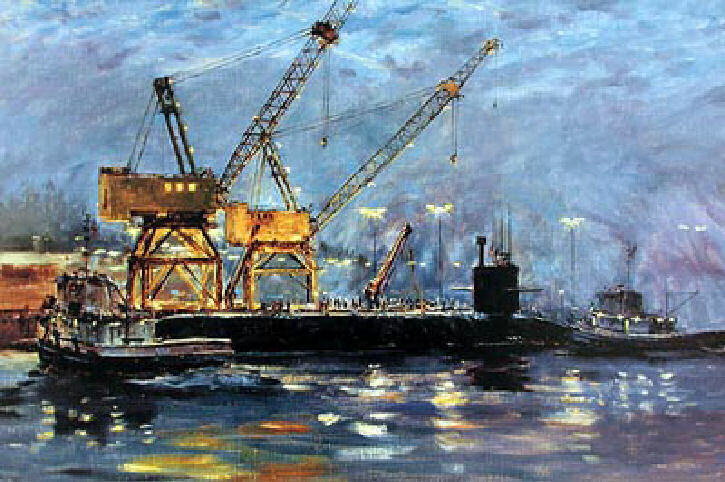 94k Oil on canvas by the artist John Charles Roach entitled "Michigan (SSBN-727), Delta Pier - Bangor". Courtesy of USNI. 48k Working topside on the submarine are some of the ship's crew and the IMF ship superintendent assigned to the incoming boat. Often, several chief petty officers will also be working on their qualifications as mooring officers. 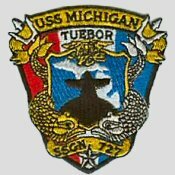 In addition to the crew of the incoming submarine,(Michigan (SSGN-727))CSS-17 sends an additional 20 to 25 Sailors to assist with line handling. On the water, guiding the vessel safely, you'll also find tugboat operators and IMF personnel assisting with small boats known as Log Broncs. Official USN photo by Katie Eberling, Command Information Officer, Naval Intermediate Maintenance Facility, Bangor, submitted by Bill Gonyo. 57k The Michigan (SSGN-727) is guided from the Delta Pier (North) to the Delta Drydock. This move marks the 200th TRIDENT dry-docking at the Intermediate Maintenance Facility, Pacific Northwest Delta Pier. Official USN photo by Katie Eberling, Command Information Officer, Naval Intermediate Maintenance Facility, Bangor, submitted by Bill Gonyo. 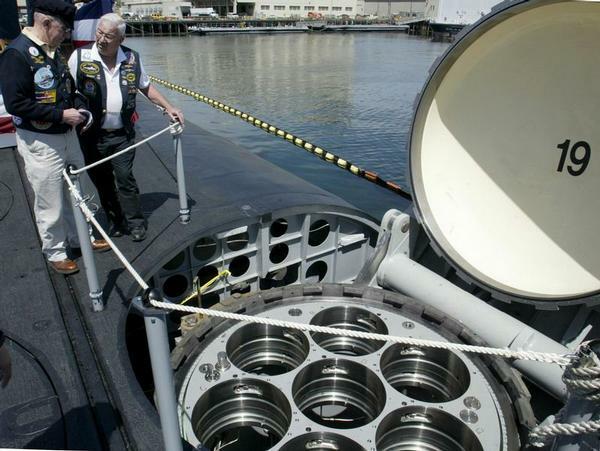 54k Ceremony attendees check out the launch tubes of the Michigan (SSGN-727) which underwent conversion from a ballistic missile to a guided missile submarine and is ported at Naval Base Kitsap-Bremerton. Photograph by Lenna Himmelstein & Kitsap Sun, submitted by Bill Gonyo. 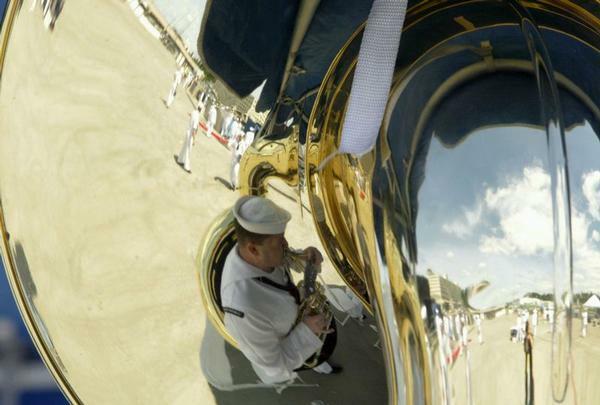 36k A tuba player for the Navy Band Northwest is reflected in his fellow members instrument Tuesday during a return to service ceremony held at the Delta Pier at Naval Base Kitsap-Bremerton. 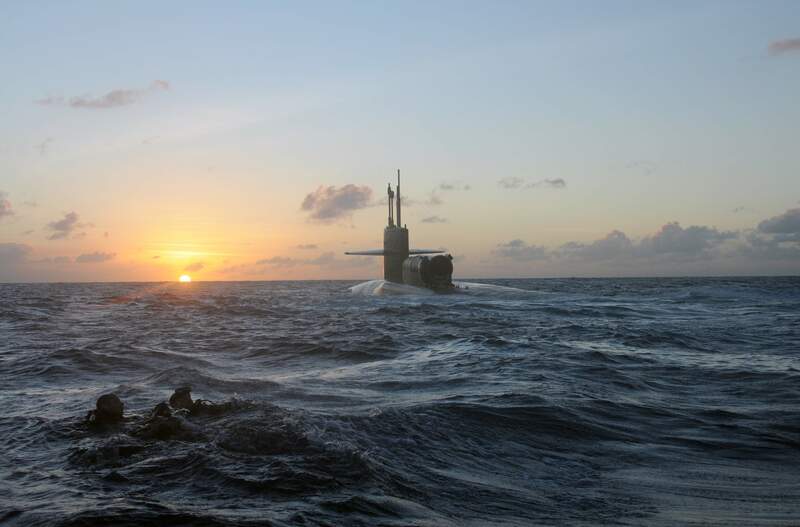 The former ballistic missile submarine (SSBN) was converted into a guided missile submarine (SSGN). Photograph by Lenna Himmelstein & Kitsap Sun, submitted by Bill Gonyo. 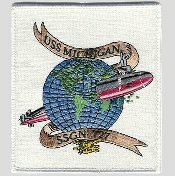 104k Michigan (SSGN-727) Executive Officer Lt. Cmdr. 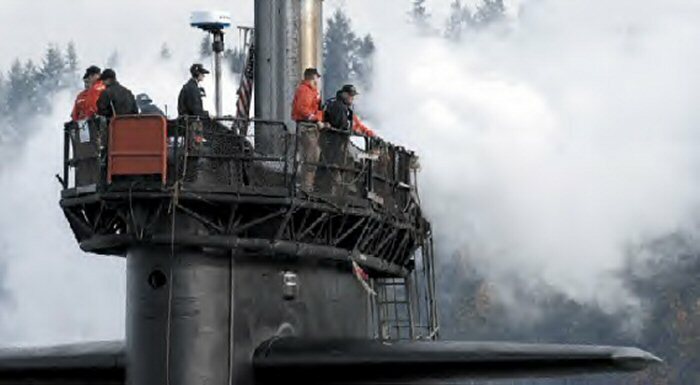 Christian Williams looks on as his crew boards Michigan toward the end of a return to service ceremony on 12 June 2009at Bremerton, WA. 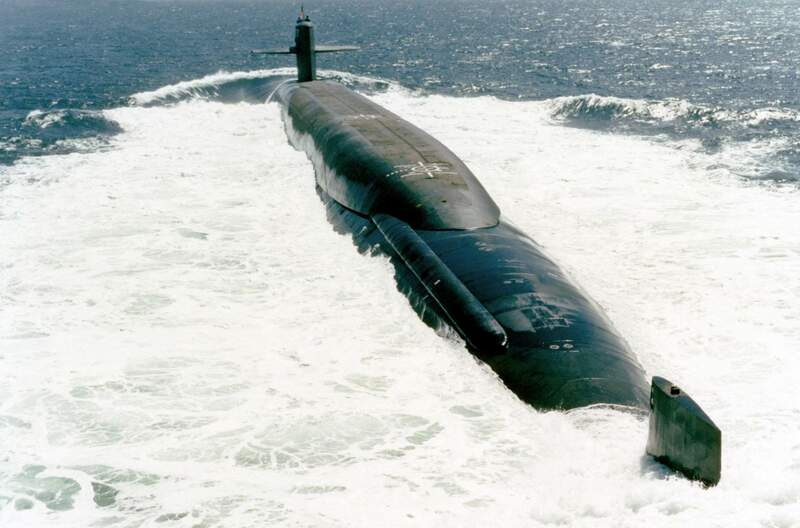 The ceremony marked the end of Michigan's conversion process from a ballistic missile submarine (SSBN) to a guided missile submarine (SSGN). Official USN photo # N-4386D-002 by Mass Communication Specialist 3rd Class Scott Dagendesh, courtesy of news.navy.mil. 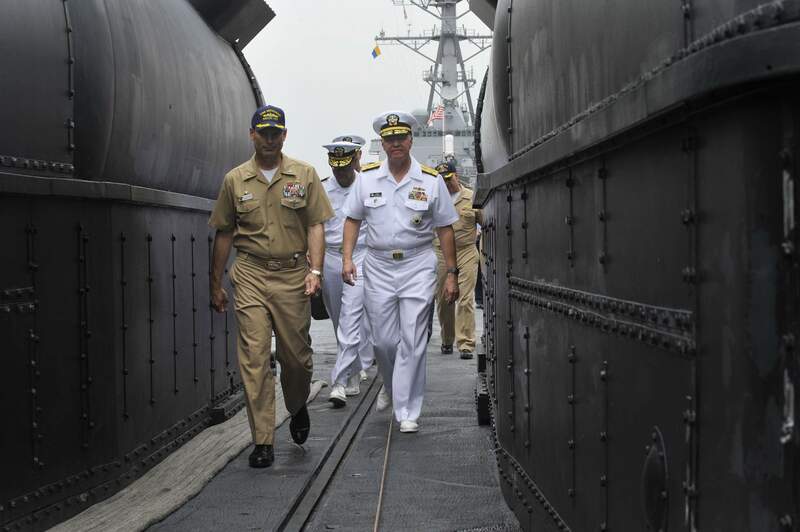 396k Chief of Naval Operations (CNO) Adm. Gary Roughead tours the guided-missile submarine Michigan (SSGN-727) while visiting Yokuska, Japan. Roughead is on an official visit to the U.S. 7th Fleet area of responsibility to strengthen global maritime partnerships. USN photo # N-8273J-139 by Mass Communication Specialist 1st Class Tiffini Jones Vanderwyst courtesy of news.navy.mil. 714k PACIFIC OCEAN (20 February 2012) SEALs and divers from SEAL Delivery Vehicle Team (SDVT) 1 swim back to the guided-missile submarine Michigan (SSGN-727) during an exercise for certification on SEAL delivery vehicle operations in the southern Pacific Ocean. The exercises educate operators and divers on the techniques and procedures related to the delivery vehicle and its operations. USN photo # N-ZK869-163 by Mass Communication Specialist 3rd Class Kristopher Kirsop courtesy of news.navy.mil. 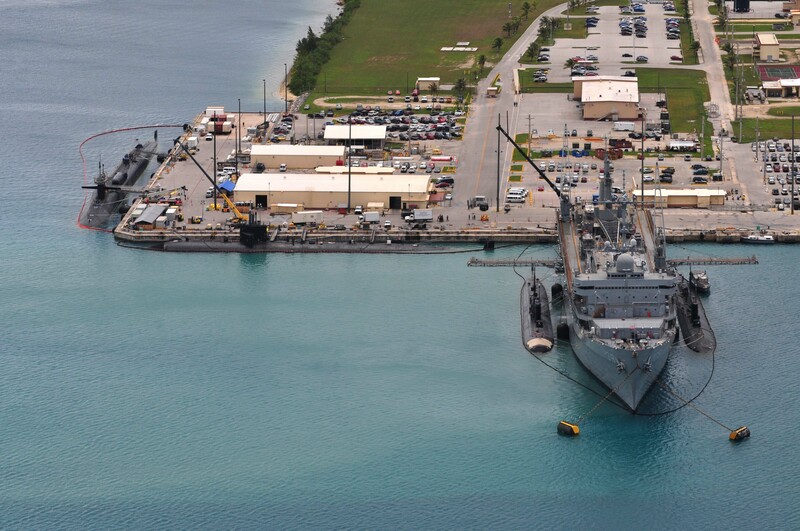 1.04k Polaris Point, Guam, 31 May 2012: The submarine tender Emory S. Land (AS-39) provides support services to the fast attack submarines Topeka (SSN-754), Tucson (SSN-770), Buffalo (SSN-715) and the Ohio-class guided-missile submarine Michigan (SSGN-727). Los Angeles-class fast attack submarines Chicago (SSN-721) and Columbus (SSN-762) are also moored in Apra harbor. Official USN photo # 120531-N-JS205-112, by Mass Communication Specialist Seaman Apprentice Samuel Souvannason courtesy of navy.mil. 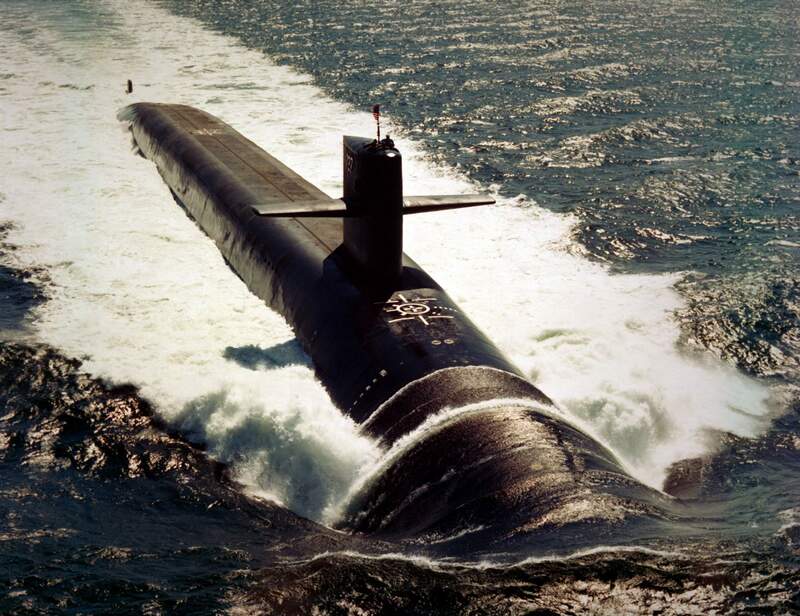 There is no DANFS History currently available for USS Michigan (SSBN 727) at the Haze Gray & Underway Web Site, the main archive for the DANFS Online Project.